Ten days out from Ullapool and I've arrived in the village of Watten, just 20 miles from Duncansby Head and the end of the Watershed. 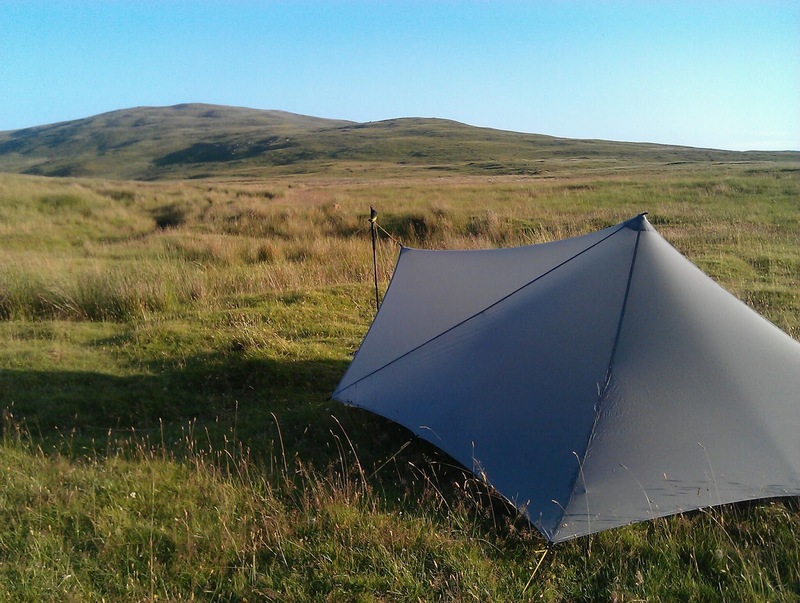 And for the last three days the sun has shone as I've crossed the vast open spaces of the Flow Country (the photo shows one of my camps in this area). Indeed the sun appeared as soon as I was east of the mountains, straight after a horrendous struggle over Ben Hee in a big storm. There were touches if sunshine on earlier days, including, fortuitously, on Beinn Leoid, where I met David Edgar who is hiking the watershed all the way to Dover. I'll follow his progress with interest. Ironically the notoriously boggy Flow Country has turned out to be the driest section of the walk as there has been no rain for many weeks. I crossed Knockfinn Heights, normally a quaking mass of mites, peat hags and pools, in sandals and my feet stayed dry. Now I am near the coast the weather has turned misty with the haar coming in off the North Sea. That should make my last day cooler. Well done Chris. I've enjoyed catching up from a day off on GR10. This sounds like a successful trip. Hope you have enjoyed following in Peter Wright's footsteps, and midges don't seem to have been too much of a problem. No doubt you've been able to put your kit to the test rather more effectively than we've been able to in the Pyrenees, although if we'd been given horse fly repellent to test, we'd be able to provide a comprehensive report! Thanks. Interesting you should mention horse flies. They were really bad the last four days. More than I've ever seen before with often a dozen plus buzzing round me. MosiGuard stopped them biting but I had to reapply it every couple of hours. Hope the GR10 is going well. Well done Chris,sounds like it's been a very varied trip in many respects; hope the big screen experience at Rheged goes well. best wishes from Mark and Helen. Well done Chris.Hope to hear of more about all you saw and learned while out there.